A remix of Ray Charles’ “Hit the Road Jack” pipes in over the loudspeaker. Spilling over the fence separating the wall and the dugout, players lean over, bobbing their heads along. The beat builds, builds, builds and drops. The players leap up, pumping fists in time. Starter Xzavion Curry takes it a step further, jumping the fence and boogie-ing down on the field to the tunes, as Tech baseball celebrates knocking yet another starting pitcher out of the game. It’s a good time to be a Jacket. Indeed, Tech has had much to celebrate these past few weeks. In what appeared to be their roughest stretch of schedule, with a road series against No. 14 Louisville and back-to-back midweek games against No. 11 Georgia and No. 17 Auburn, Tech has instead solidified their tournament resume, going 4-1 in those games. Embarrassing Georgia 11-2 in a rain-shortened affair after going winless against the Bulldogs for two years couldn’t hurt morale either. After dropping their ACC-opening road series against Miami 1-2, Tech has not lost an ACC series, winning a close three game set at home against Virginia, coming within one out of sweeping Louisville on the road — just missing out on being the first team to sweep the Cardinals in a three game road-series since 2005 — and handling the Notre Dame Fighting Irish this past weekend. Tech is still in search of its first conference sweep — hence its relatively weak conference record of 7-5 — but Tech has still looked like every bit the ACC powerhouse preseason evaluators predicted it to be. Tech might have just easily been 9-3 if the Jackets had avoided some late-game bullpen breakdowns, but there’s no changing the past — and Tech is charging forward at full steam. Surprisingly, Tech has not been buoyed over their most recent stretch by Kyle McCann, who has cooled off after opening the season as the East Coast’s best hitter — rather, Tech’s superb starting pitching has carried them through this stretch. Curry thoroughly dismantled the Cardinals’ offense in Tech’s first game of the series, limiting Louisville to just one hit and one earned run on eight innings of work. Not to be outdone, stellar southpaw Connor Thomas hurled a complete game shutout in the following game. The Jackets held Louisville, averaging 6.2 runs per game, to just five runs total over the series. Indeed, Tech’s starting pitchers are turning heads everywhere. After being named D1Baseball.com’s best draft eligible pitcher entering the season, Thomas was named ACC pitcher of the week following his performance against Louisville, and Sunday starter Brant Huerter was highlighted by FanGraphs.com as a pitcher whose draft stock is steadily rising. 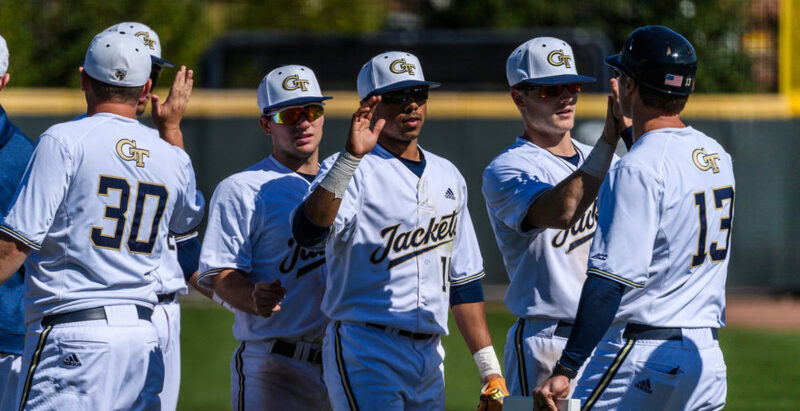 While McCann has been the obvious attraction for the Jackets, Thomas and Curry — both draft eligible this year — might yet find some attention from MLB teams on draft day, as may other Tech juniors. Indeed, at last week’s midweek game against UGA, numerous MLB scouts were in attendance despite the rainy weather. Tech’s position players have also contributed through this stretch as well — OF Baron Radcliffe, who struggled last year to the tune of a .180/.229/.348 line, has been heating up, hitting three home runs during Tech’s gauntlet against top-25 teams, and DH Michael Guldberg is hitting at an incredible .467 clip for Tech. Tech’s journey to the postseason still has a way to go — after all, Tech still has road and neutral-site games against Georgia on the docket, and an entire half of ACC baseball play to go. Still on the docket? ACC powerhouses like UNC and Clemson. Still, Tech can look on their most difficult stretch of baseball in the rearview mirror and know that they rose to the challenge and excelled. With top-25 wins notched in their belt, Tech can step up to the plate each game with a bit more swagger — they’ve been through the gauntlet already. Opposing teams, take your best shot — at your own risk.